Kaya Fishing Supply Inc. in Chinatown is small, humble and easy to miss as you speed past it on the way to Nimitz Highway. Yet it's been around for three generations and going, beginning with Kaichi Kaya, a Japanese immigrant to Honolulu who used to sell shave ice from a pushcart. Kaichi Kaya passed the business on to his son, Jack Kaya, who was actually born by a midwife in the back of the store. Now Maurice Kaya, 64, runs the store his grandfather started in 1911, and possibly earlier. He says not much has changed in the small store, which offers all the fishing supplies and gadgets you could imagine, from fresh bait to hooks, weights, lures and scoopnets to all types of rods and reels. At Kaya Fishing Supply, you can still get a set of five, 8-ounce weights for $2. The main difference in the store today, said Maurice Kaya, is that it carries the fancy nitro casting rods offered by larger stores. Kaya said he had to carry the rods to keep up with technology. But the store is still open seven days a week, as it has been for the last 95 years, offering all levels of fishermen the supplies they would need, as well as a listening ear for fishing stories, and fishing advice. Kaya wakes up daily at 4:30 a.m. to get the store ready. Doors open at 7 a.m. and close at 4 p.m. But if an early-morning fisherman knocks on the door earlier than opening time, he might get lucky and find Kaya there. Sundays, the store is only open from 7 a.m. to 11 a.m.
Kaya has three grown sons, but none of them are interested in taking over the business since they have other careers -- one is a high school chemistry teacher at Punahou, another is an account executive at Ceridian and the third is an animal veterinarian in Manoa. So Kaya has his hanai son, Raine Nitta, who he plans to pass the business on to when he retires. 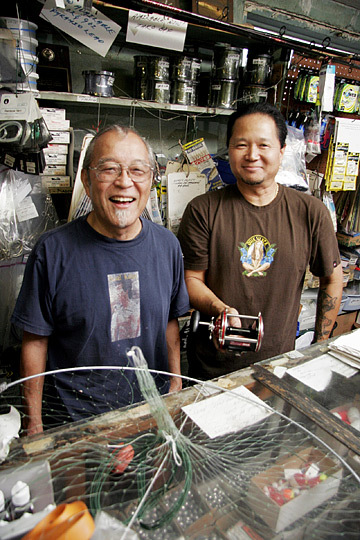 Maurice Kaya, left, owner of Kaya Fishing Supply Inc. in Chinatown, plans to pass the business on to his hanai son, Raine Nitta, right, when Maya retires. "Pretty much everything I learned from him (Kaya), plus the customers," Nitta said. "You meet a lot of different kinds of people, from older folks to their sons." Except that he's not planning to retire any time soon. After all, Maurice's father, Jack, didn't retire from the store until he was 72. Nitta, 44, spent practically his entire life fishing. He started fishing in the Kapalama canal with his grandfather when he was barely 5 years old. He began hanging out at the store in elementary school, and Kaya put him to work. Fishing is Nitta's passion -- one that takes him all over the island -- especially for the giant uluas, which put up a good fight. "Pretty much everything I learned from him (Kaya), plus the customers," Nitta said. "You meet a lot of different kinds of people, from older folks to their sons." The store draws many father-and-son pairs, and grandfather-and-son pairs who fish as a bonding experience. Before taking over the business, Kaya worked in construction. But when his mother, Lillie, started having eye problems, he went to the store to help his father out. Eventually he took over the business. Kaya's wife, Judith, is a schoolteacher that now develops curriculum. She doesn't help out at the shop -- but she loves eating fish, according to Kaya. He has one granddaughter -- Shanna -- who he plans to teach fishing once she's old enough. 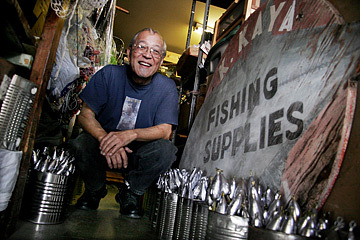 Maurice Kaya, owner of Kaya Fishing Supply Inc., kneels next to an old sign and cans of shiny lead weights inside his store in Chinatown. Kaya said the arrival of bigger stores, like Kmart and Wal-Mart, haven't had too much of an impact on his business. He waved off the notion that they would take away his customers. "We've got the personal touch here," he said. Besides offering knowledge and advice that comes from a lifetime of fishing, Kaya said the store offers custom rigs. The store caters to hard-core fishermen who are seeking items like custom rigs, but also will help novices start out with the simplest fishing tools -- a bamboo pole, filament and bait. The store brings in fresh bait twice a week. "They won't get that at the big boxes," he said. He'll lend an ear to any customer who walks into the store, from novice to expert, looking for some tips -- he just won't tell them his secret fishing spot. The store makes a decent profit, according to Kaya, though he declined to reveal the annual revenue. "I'm not a millionaire," he joked. But years of experience means the store has established some of the best supplies from distributors worldwide at what Kaya considers reasonable prices. Kaya says each of the items in the store are personally tested, by him and Nitta. He estimates there are at least 500 regulars that shop at the store, which eventually branches out to include their friends, their sons and grandsons. There also are customers from as far away as Australia, as well as the mainland, Molokai, the Big Island and Lanai. 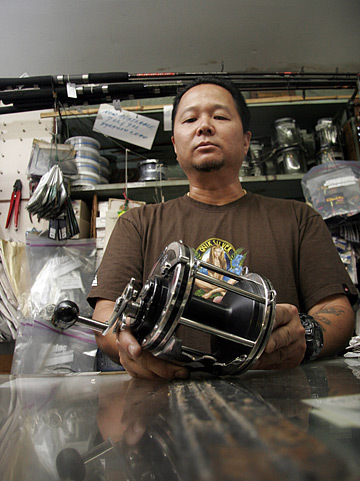 Raine Nitta, of Kaya Fishing Supply Inc., shows off a Penn reel heavy enough to pull in a 100-pound ulua. After nearly a century of doing business in Hawaii, Kaya says there's little need for advertising or marketing -- he doesn't spend a cent on it. Instead, he relies on word of mouth and occasionally, a fishing article, to bring customers into the store. His store, along with a handful of other small fishing supply stores on the island, fill a niche, he said. He's not related to the Kayas who run the Hana Pa'a fishing supply store on Dillingham Boulevard -- unless you go way back several generations in the Kaya name in Japan. He doesn't plan to move from his corner spot at 901 Kekaulike St., where it's been since 1960, which is ideal, he said, because it's right across from Honolulu Harbor. That's the same harbor where his grandfather used to fish from a small boat. Before that, the store was on Queen Street. Nor does Kaya plan to add fancy shelves or display cases. The items in the tiny store sit stacked in piles on the floor, or on shelves, and hang from hooks. There is no Web site, and there are no online sales. The only improvement to the store is a new sign to replace the hand-painted wooden one that his father-in-law made several decades ago. Despite the shop's longevity, he knows that running a small business is a risk. Some days bring in plenty of customers, and other days are slow. "Certain days we hit the jackpot, and other days are average," he said. "I don't play craps because I gamble here every day." » Address: 901 Kekaulike St.
» Hours: Monday-Saturday, 7 a.m. to 4 p.m.; Sunday, 7 a.m. to 11 a.m.